Synopsis: Hidden under the surface of everyday London is a city of monsters and miracles, where wild train spirits stampede over the tracks and glass-skinned dancers with glowing veins light the streets. When a devastating betrayal drives her from her home, graffiti artist Beth Bradley stumbles into the secret city, where she finds Filius Viae, London's ragged crown prince, just when he needs someone most. An ancient enemy has returned to the darkness under St Paul's Cathedral, bent on reigniting a centuries-old war, and Beth and Fil find themselves in a desperate race through a bizarre urban wonderland, searching for a way to save the city they both love. 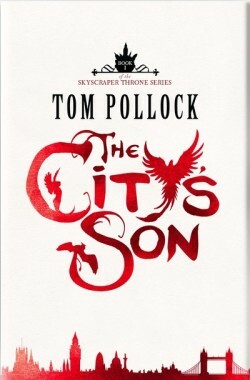 The City's Son is the first book of The Skyscraper Throne trilogy: a story about family, friends and monsters, and how you can't always tell which is which. Legend has it that the streets of London are alive. Legends tell of statue-people, of glass light-bulb nations that inhabit street lamps and forgotten trains that patrol the tracks as wraiths, but the greatest legend of all is the Goddess of the Streets, Mater Viae. For thousands of years she ruled, righteously, powerfully, and full of avengence. She made sure Reach, the Crane King, didn’t destroy the City like a cancerous tumour. London has been the epicentre for many a novel; something about the urbanised history of great Cathedrals, spires and monuments is always ready to capture the imagination of a novelist. But perhaps none so – at least on the Young Adult scene – have managed to capture the City quite so vividly and imaginatively as début author Tom Pollock, whose vision of a living city parallels that of Cornelia Funke’s medieval, fairy-infested InkWorld that plays centre stage in the Inkheart Trilogy and the acclaimed China Mieville. In part, the success of Pollock’s creation lies with his prose, which is rich in beautiful descriptions of the City in rain, orange lamplight and baking heat, though his descriptions of luminescent, glass women surpasses even that: “brightly burning filaments twisting like arteries under her transparent skin as she flowed down the lamppost to the ground.” Then, of course, there are the descriptions of big, hulking “Rail Wraiths”, ghost-trains that haunt forgotten tracks in the hope of finding passengers, which are not altogether beautiful but mighty in an urban, industrial sort of way. Sadly, The City’s Son isn’t all fun and games and Tom Pollock hasn’t quite perfected his craft yet. I found that his plotting held back the novel, drawing it out in places that didn’t need as much coverage and only glossing over parts that deserved to have a bit more page-time. As well as that, the climax The City’s Son comes to isn’t as grand as the build-up makes out as things come together a little to easily and briefly: though Pollock’s imagination does shine through in places. The story is told predominantly in third-person omniscient, though at times, Pollock strays into the first-person for his male lead, Filius. This is somewhat superfluous, as the first-person narrative doesn’t seem to serve any purpose that a third person narrative couldn’t have have achieved; it seems to be included for inclusion’s sake, and though brilliant, seems redundant. Though it could be said that The City’s Son is less of a character-based novel than a concept-and-plot driven novel, all good stories need good characters and these are delivered in the likes of not only Filius and Beth, the two leads, but also several other supporting characters. Filius is a somewhat lost and direction-less street urchin, known not for his own achievement but for the reputation of his Goddess mother, which plays quite hard on him sometimes. Beth is deviant street-artist, drawing her characters all over the City where there is space and imagining herself a better world where her Father hasn’t neglected her in favour of mourning for their long-lost wife and mother. As Filius says, Beth makes him brave and it’s when they come together that the the characters really flourish. Predictably, there is some romantic tension, though in this case, not enough! The City’s Son is an extremely impressive début, and though it has its shortcomings, these blur into insignificance at the sheer imagination of the world-building. Tom Pollock is the Cornelia Funke of an urban generation, and you’d struggle to find a more vividly imagined London. The City’s Son is set become one of the crossover novel of 2012, with an appeal not only for its YA audience but also adults looking for a beautifully envisaged tale. What did you think about The City’s Son? Great review! I received an ARC of this without actually hearing anything about it, so it’s great to see someone’s thoughts on it. You’ve certainly encouraged me to pick it up soon.